MIRACLES ABOUND AMONGST US ON EARTH. In this life that we live in, certain events and occurrences are yet to be completely appreciated and comprehended. For example, it is common knowledge that a woman is expected to carry her pregnancy for a period of 9 months, after which delivery of the baby is expected. Nevertheless, there are recorded cases of women who require as much as 1 to 3 years before the delivery of their baby. When the previous occurs, it is regarded as a model; on the contrary, when the latter occurs, it is regarded as out of the ordinary. Uncommon events are sometimes regarded as miracles. Miracles and their realism have been debated among religious and philosophical scholars. While some believe and uphold its presence, others frown at the claims that it exists, describing it as a mere plot to coax people into believing the doctrine of a particular religion. Interestingly, there are several recorded happenings which suggest that miracles abound amongst us on earth and it is indeed a reality. One of such is the case of Mrs. Okorie Esther. At 43, Mrs. Okorie Esther from Anambra state, East of Nigeria was diagnosed of Mal-united tibia, plateau fractures and fracture of the left ankle. Her mobility was aided by the use of a set of crutches, which she ensured was always her companion, in order to move around, albeit so much in serious pains and discomfort. She had been booked for a total knee replacement. The doctors had advised that she should reject the only option that could ensure that she would walk again as a normal person. The advice from the medical doctors was necessitated by the fact that, at 43, she was too young to undergo that kind of procedure, and this could result in total loss of the use of her legs and their functions. In an attempt to recover the use of her legs, Mrs Okorie had resorted to herbalists, who milked her of her money, guaranteeing eventual success. When she realized that this was yielding no tangible result, she decided to turn to God for a miracle. With the numerous miraculous healings that she had read about and saw on Emmanuel TV, she decided that her next and final port of call was The Synagogue, Church Of All Nations, where she believed that with a touch from Prophet TB Joshua, she would be declared free from her terrible condition. Continuing she said: “I have gone to many hospitals and the condition has not improved. I have even visited different herbalists, but all to no avail. I remembered that I once saw how people were healed on Emmanuel TV; I have also read testimonies of people that were healed by God through Prophet TB Joshua. I then decided that this was the final destination for me to receive my healing. I have come from Abuja because I believe that God can use the man of God TB Joshua to heal me”. Interestingly, before praying for her, Prophet TB Joshua turned to the large number of worshippers inside the church auditorium and asked a question. He asked: “Do we have anyone here that believes that God cannot use him or her to perform miracle at all? You believe that God cannot use you, you believe that there is no miracle, you find it difficult to believe that there is miracle – stand up”. “I find it hard to believe that there are miracles. I don't believe it because I cannot understand how it works” screamed a young man, who jumped out of the crowd with enthusiasm. “My name is Obachide Ani, a Nigerian based in South Africa and although I have been a Christian for a very long time, I am yet to believe in miracles because I don't understand how it happens. That is why I find it hard to believe it,” he said. 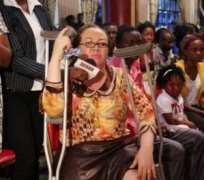 Prophet TB Joshua: What do you understand is her problem? Mr. Obachide Ani: It's worse, man of God. Prophet TB Joshua: Go and meet her and find out the situation she is in; so that I can now reveal God to you. Mr. Obachide Ani: Ok, man of God. Prophet TB Joshua: Anybody can be used to raise the dead but to maintain that grace of continuing doing it is where the problem lies. You go there now and touch the woman. You first of all ask for forgiveness and say “Lord, your mercy and favour is all I need”, Prophet TB Joshua continued. Repeat after me “Thank you lord. Your mercy and your favour is all I need. Forgive my sins Lord.. Son of David, have mercy on me and commit yourself to the healing of this sister in Jesus Christ's name”. You can now bend down and touch the leg. Mr Ani offered the prayer and touched her legs. Prophet TB Joshua then instructed Mr Ani to hold her right hand and lay his hand on her head, praying to God to heal her. After praying for her, Prophet TB Joshua told the woman, “Woman, it is not this man that is working, it's God – rise up”! Immediately, Mrs Okorie, whose only means of mobility was the crutches, stood up and walked by herself. “I am healed! Thank you Lord”, she screamed. Joy filled the air as Mrs. Okorie shouted at the top of her voice, thanking God for declaring freedom on her life and ending the pains and suffering she had endured. This miracle in the life of Mrs. Okorie Esther confounded Mr. Obachide Ani and served as a proof to him that indeed miracles abound in the midst of men, and that God is the same today, tomorrow and forever; He never changes. God can use any medium to express Himself to man and He chooses whichever vessel He deems fit, sometimes going against the expectations and criteria of man.